From historical studies, we have learned some amazing truths about the way people actually drive cars, and we’ve come to understand some of the habits of typical drivers. We know, for instance, that average drivers will adjust their radio 7.4 times per hour of driving, will turn their attention to an infant 8.1 times per hour, and will search for in-car personal items 10.8 times per hour. We’ve also learned this: On average, drivers tend to look away from the road for 0.06 seconds, once about every 3.4 seconds. Quite startling, actually. If something diverts a driver’s visual attention away from the road for more than 1.5 seconds it has come to be officially recognized as a “distraction.” If a distraction is found to be due to the vehicle itself – say, an on-board system or display – we can rest assured that vehicle manufacturers will endeavor to find remedies during the development stage. This presents a compelling use case for driving simulators – not just due to the safety reasons mentioned above – but for efficiency reasons (since even multivariate aspects of driver distraction can be studied in a short period of time using a simulator). However, if driver distraction (or diligence) is observed in a driving simulator lab, how can one know whether the distraction (or diligence) is real or simply an artifact of the driving simulator experience itself? (i.e., Is the very act of “driving” a driving simulator somehow affecting cognitive workload, thus influencing measured behaviors?) This is a valid question. 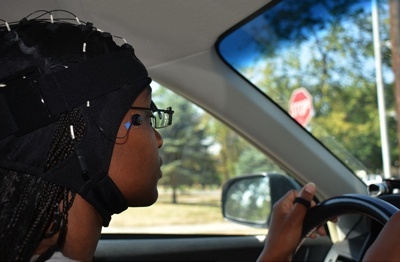 Assuming a reasonable level of vehicle and scene modelling fidelity, the scope of any human factors study or behavioral study that takes place in a driving simulator can be limited by the performance capabilities of the simulator used in the experiments. The motion cueing delivered by a medium size hexapod, for example, while acceptable for common drivers and useful for general survey work, may not be informative enough for certain experiments, especially those involving dynamic vehicle maneuvers. Luckily, the newer generation of advanced, engineering-class Driver-in-the-Loop (DIL) simulators is up to such tasks. Since this class of simulator was developed for professional test drivers focused on core vehicle design and development work, the dynamic performance and sensory stimulation capabilities are well beyond the level required to give average human drivers a car-like experience. With such engineering-class DIL simulators one can, at the very least, assert that cognitive interference is minimized as much as is technically possible. This, of course, raises confidence levels and expands experimentation envelopes. In addition, there are a few fringe benefits. Engineering-class DIL simulators are creating entirely new ways of looking at human-vehicle interactions. For example, by collecting real-time biometric information from human drivers in parallel with the telemetry streaming from virtual vehicle models and environments, new data analysis methods are emerging that can rapidly inform vehicle and on-board system developments. Traditional biometric measurements such as eye movement and muscle action can be re-cast as contributing players in vehicle dynamics events. For example, human reaction times and vehicle maneuver instigations can be measured at the muscular impulse level and related to classical vehicle dynamics; a time trace of a driver’s gaze direction can be related to on-board system triggers and the timing of control system interventions; and so on. From an ADAS development perspective, this is clearly valuable. Instead of relying purely upon subjective methods to assess a driver’s interaction with on-board systems, engineers can also query objective driver data in order to assess system effectiveness. Adding this objective data into the mix is not only a validation for subjective assessments, but it’s also a real-time bellwether that informs system tuning decisions while experiments are taking place. This field is so new that it’s not yet clear what applications might open up for these new, combined streams of human and machine data. The point is that they’re there and ready to be accessed – just another way in which engineering-class DIL simulators are continuing to provide automotive engineering teams with new productivity tools. To learn more about how DIL simulators can be used to explore the complexities of driver-vehicle interactions and contribute to the vehicle development process, download our FREE white paper, “Look Down the Road: Driving Simulator Technology & How Automotive Manufacturers will Benefit”.